In the early twentieth century, World War I was the most devastating event humanity had yet experienced. New machines of war left tens of millions killed or wounded in the most grotesque of ways. The Great War remade the world's map, created new global powers, and brought forth some of the biggest problems still facing us today. But it also birthed a new art form: the horror film, made from the fears of a generation ruined by war. 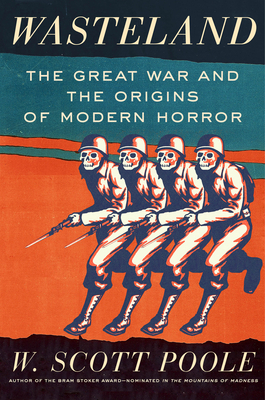 From Nosferatu to Frankenstein's monster and the Wolf Man, from Fritz Lang, F. W. Murnau, and Albin Grau to Tod Browning and James Whale, the touchstones of horror can all trace their roots to the bloodshed of the First World War. Historian W. Scott Poole chronicles these major figures and the many movements they influenced. Wasteland reveals how bloody battlefields, the fear of the corpse, and a growing darkness made their way into the deepest corners of our psyche. On the one-hundredth anniversary of the signing of the armistice that brought World War I to a close, W. Scott Poole takes us behind the front lines of battle to a no-man's-land where the legacy of the War to End All Wars lives on. W. SCOTT POOLE is a professor of history at the College of Charleston who teaches and writes about horror and popular culture. His past books include th award-winning Monsters in America and the biography Vampira: Dark Goddess of Horror. He is a Bram Stoker Award nominee for his critically acclaimed biography of H. P. Lovecraft, In the Mountains of Madness.